I used to have a beautiful meadow behind my house. I rent the house, and my landlord also owned the adjoining meadow with its stand of redwoods. Often, I would sit at my kitchen window and gaze at the meadow. Over a two year period I watched countless deer and other wild creatures wander in and out. One day, I was even graced by the magical appearance of a gray fox. I always knew that the meadow was for sale, but there was a history of permit and zoning problems which I figured (and hoped) would go on indefinitely. One day, to my surprise and dismay, the bulldozers arrived. A sale had finally gone through and the new owner of my magical meadow was building a house on it. The meadow was dug up, the foundation poured, and the new house, all two stories of it, sprang up all in a year’s time. The new owner erected a six foot fence between the two properties, and my meadow (as well as my view of the redwood trees) was gone. I was left with a slash of hardpan for a backyard. For about six months I grieved and considered moving. But finances and a dense rental market made this a pipe dream. Then I schemed about how to landscape my little plot into something precious and beautiful. Tea house? Carp pond? Bamboo forest? Rock garden? All of it was too expensive and didn’t solve the problem of the huge house now looming daily over me. I felt oppressed and anxious. Then one day, after reading an article about tree planting as a way of honoring the Earth, it came to me. I would plant a sacred grove in my little backyard tract. 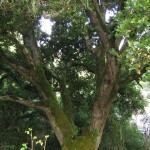 I researched trees that worked well in my neck of the woods, and picked ones that would grow to an appropriate height. Then I made a field trip to my local nursery and found several trees in 10 gallon pots on sale. I bought six trees and brought them home. For two weeks I let them sit in their pots in the yard, every few days moving them to and fro to get them situated in just the right spots. Then I had a planting day, got them all nestled in and well watered. I was amazed at what happened. I had expected to have to wait several years to feel a difference. After all, the tallest of my trees, an olive, was only about 12 feet. Barely tall enough to top the fence much less challenge the overwhelming presence of the looming house next door. But the morning after my little trees went in, I rose and took my pot of tea outside to check on them. There they were, staunch and lively, young branches shimmering with morning dew. I walked around and touched each one, saying good morning. They seemed to smile back at me. I sat with my tea on the back porch, looking at my trees and suddenly realized that this was the first time since the new house was built that I had enjoyed sitting on my back porch. And to my astonishment, I hadn’t even noticed the big new house next door. The lovely little trees were so filled with life and promise that they took all my attention. Without even planning to, I had engaged the power of growth (we call it the wood element in feng shui,) and used it to bring balance and harmony to a dead space. I notice this over and over in feng shui–a small seemingly unspectacular adjustment in the environment can catalyze powerful changes. In my case, I found that my entire mood changed after planting these six small trees. I began to feel creative again. A subtle depression lifted. I engaged in my work with renewed energy, and money started flowing. One of my teachers often advises his clients to plant a young native tree in their yard. 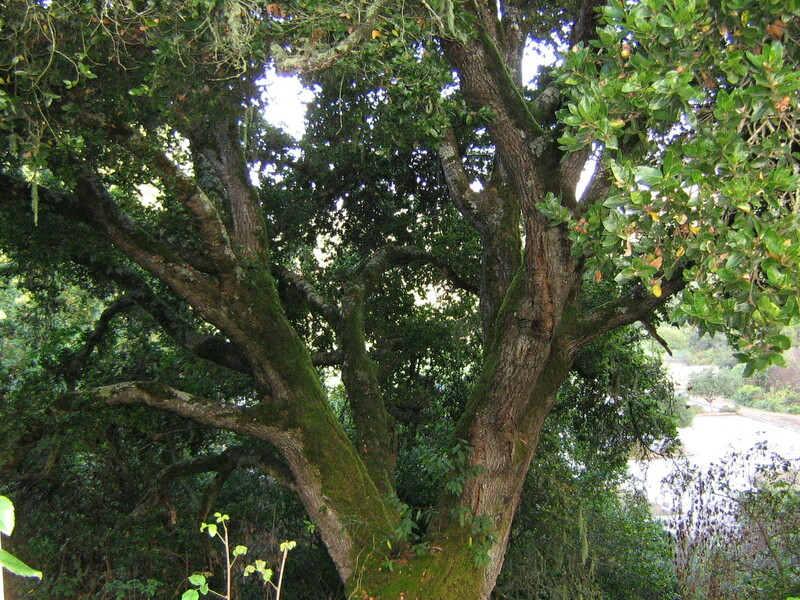 This young tree, he says, attracts the attention and loving care (the qi if you will) of grandmother trees in the area. They sort of huddle up and pour down grace and protection. You get to benefit from this generous outpouring of tree chi. This view is a profound statement about the reciprocity of the interconnected universe we live in. We actually share chi. I know. My six little trees tell me so each morning. This entry was posted in Wind and Water, Yard and Garden and tagged garden, trees. Bookmark the permalink.